New Delhi, August 27: Sitting Rashtriya Janata Dal MLA from Okhla Asif Mohammad Khan today joined Congress party ending speculation of his forming a third front in collaboration with some other MLAs. 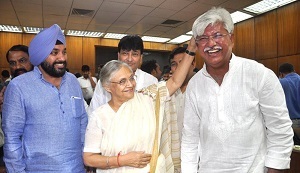 Punjabi pop singer Daler Mehndi also joined the party in the presence of Delhi chief minister Sheila Dikshit and other Congress leaders. Ram Singh, MLA of Bahujan Samaj Party and Ram Singh Bidhuri, a former Nationalist Congress Party (NCP) legislator, and V K Monga also joined the Congress. Mehndi and four others had applied for party membership and their requests have been accepted, said a source in the party’s Delhi unit. Asif Khan had won the Okhla seat that includes Batla House area riding on the wave of Batla House encounter in 2008.